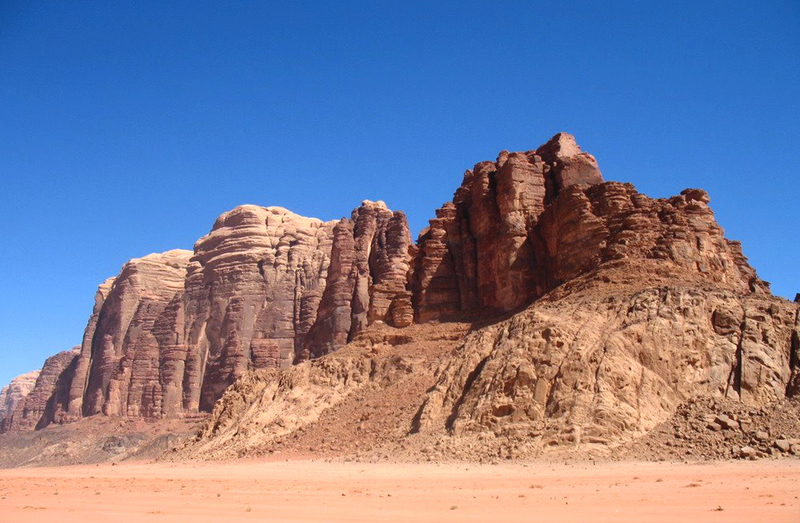 I have seen and heard much about the spectacle of Wadi Rum’s amazing technicolour sandscape, but turning off Jordan’s main highway into the desert, I still can’t quite believe my eyes. I pull over, squinting out the car window at a surreal vista of luminous apricot sand dotted with light green flora, the ever-present haze fuelling the sense of mirage. This is only the beginning, however. I pause at the visitor centre to inform the waiting boys of my guides’ names and pay my entrance fee of 5 Jordanian Dinars, which goes toward assisting the local Bedouin community and the preservation of this national protected area and World Heritage Site. Parking up outside a restaurant in the village, I open the car door and am greeted by a sheet of hot air as if from an oven, along with my tour guides: Ahmed and Attayak of Bedouin Roads. We are served sweet, hot tea — a seemingly anachronistic choice in this climate, but studies have shown hot drinks can actually work to cool one down. I lose count as my companions heap spoonful upon spoonful of sugar into the liquid, ‘for energy’. We soon head further into the wadi by four-wheel-drive, speeding along one of the many paths criss-crossing the sand, to take shelter from the midday sun in the shade of a mountain. It’s hard to believe that this arid wadi (valley) will swell with water upon the arrival of the rainy season. Here, we chat, eat, drink — and wait. As the shadows shift, the sun advancing towards the blanket we have laid out, the guides swap stories of desert hardiness — days spent climbing the surrounding peaks during Ramadan, without a drop of water from sunrise until sunset. Though the heat doesn’t waver, eventually it is decided that the sun has dropped low enough for Ahmed and me to move on. For visitors to Jordan, the term siq, or shaft, is synonymous with The Siq, the iconic entrance point to Petra. 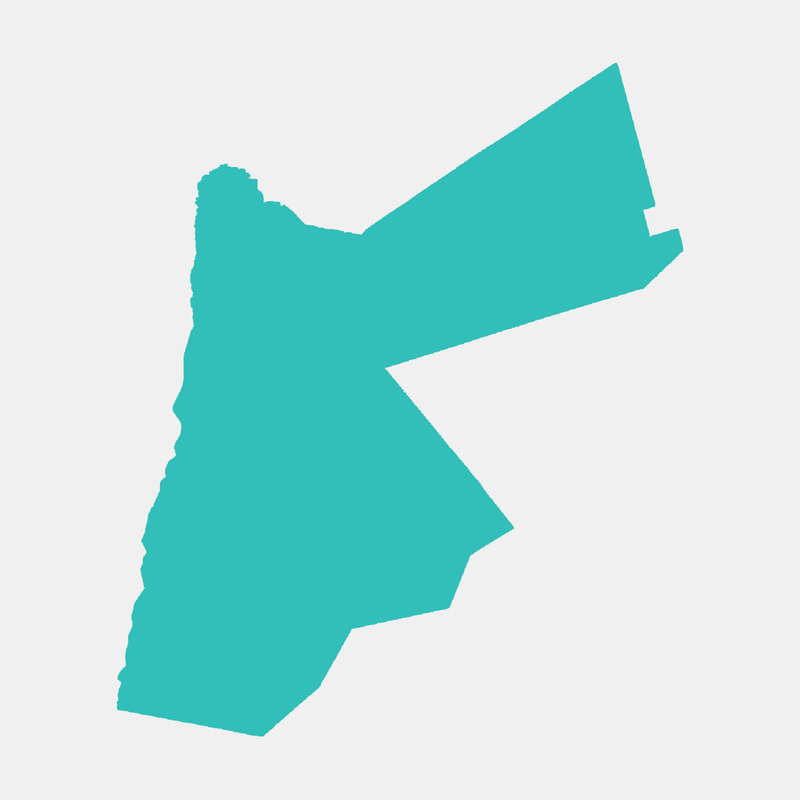 However, the wadis of this land contain many such shafts, slicing through the mountains scattering the landscape. Stepping into this next siq’s narrow confines, I am enveloped by shade, providing respite from the heat and allowing closer, more comfortable inspection of the geological wonders on offer. The ‘walls’ are layered in burnt orange, apricot, mauve, and grey-blue. Ledges are dusted with red sand. Peering out to the expanse of the desert, ages of erosion play out before my eyes, these sheets of rock reconfiguring themselves into a softer, more dynamic incarnation, the dunes a gradient from dark to light and back again, an alien backdrop to the greenery I can now observe up close. Unfortunately my guide is less than communicative, meaning I cannot identify where I am on a map or checklist of Wadi Rum must-dos. I surrender my wish list and go along for the ride — literally, making myself at home on the brightly cushioned bench seats on the back of the jeep before being pointed in the general direction of my next task. A striking red dune, Umm Ishrin, cuts decisively across the landscape out of the lighter plain, beckoning me to climb it. Although its lightly-pocked surface indicates I am by no means discovering new land, previous visitors’ footprints have been all but washed away by the wind, leaving slight grooves which are filling with tiny green leaves. I am hesitant to corrupt the smooth slope and make my way surreptitiously up one side bordered by rock ledges, where a dark, burnt-looking crust against the fiery sand recalls images of cooling magma. At the top, names and initials have been carved into an amenable stone wall. The temptation is understandable — for such an unreal place to exist in the world, to have made it there seems to require some ceremony. I pause and take in the panorama — the shifting shades of sand now visible on a grander scale, wreathed by barren, plateaued mountains — and the ground beneath my feet, scattered with small rocks in the wadi’s signature colours, preparing to dissolve into the dunes. I make my way down the other side, white boots sinking deep into the seemingly-untouched orange sand. 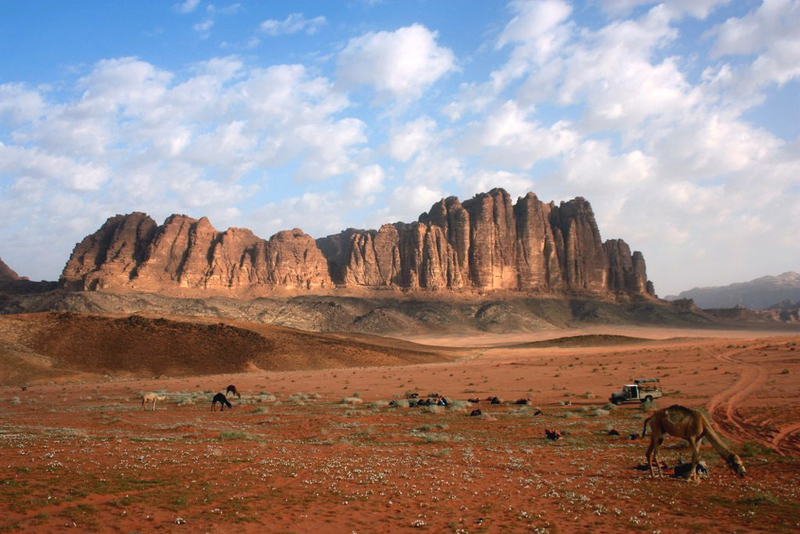 Aside from its natural heritage, Wadi Rum is known for its cultural patrimony, with tens of thousands of petroglyphs and inscriptions serving as evidence of the area’s 12,000 years of inhabitation. 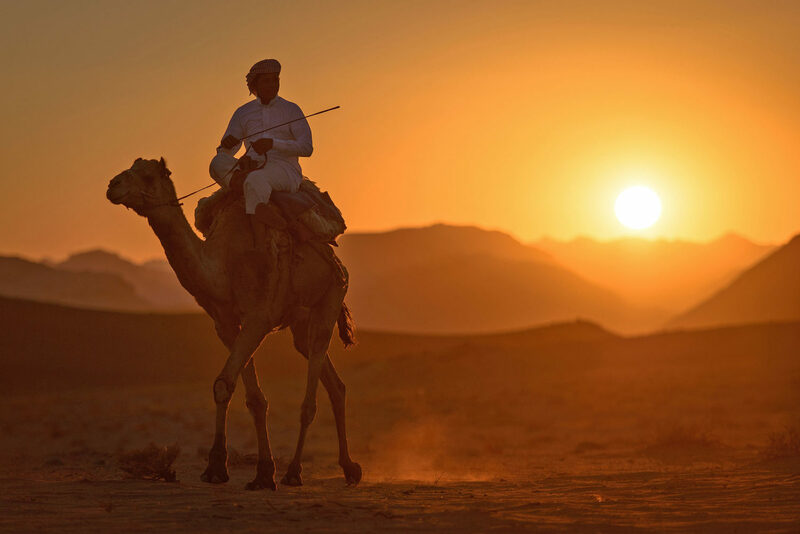 We pause at one site known as ‘The Map’, though I am still lost: the only figure I am able to recognise is that of a camel and rider — a common motif around here. 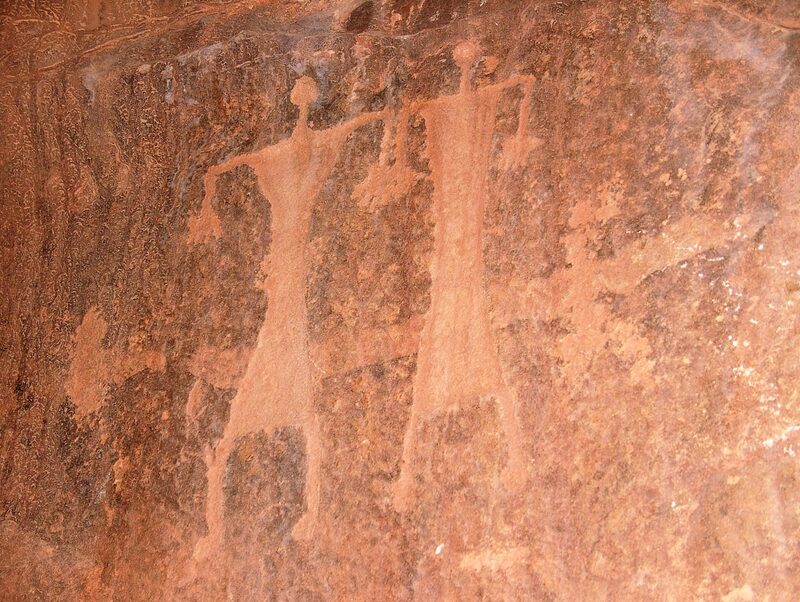 Over 25,000 ancient petroglyphs adorn the crags and rock faces of Wadi Rum. It seems those who had climbed the red dunes are not the only ones carrying on this tradition, as I spot on nearby ‘canvases’ a delicately-rendered – if startled-looking – charcoal ibex, and green spray-painted Arabic lettering. I clamber up one more hillside before the light starts to fail — these views never get old — and it is time to head to camp. Attayak’s camp, tucked into a cliff face, is simple but functional, and extremely comfortable. A square arrangement of tidy, monochromatic striped tents backs onto an indoor/outdoor common area with basic kitchen and bathroom facilities — the former of which produces some surprisingly impressive food. Food is definitely a motivator for Attayak’s oldest camel, who roams the desert as she pleases, but always comes home for dinner. Evenings are spent lounging outside under the stars, talking and singing — and drinking more tea, of course. The next day, I am itching to tackle some of the wadi’s more challenging landmarks, but despite my best persuasive efforts, my guides’ hesitance to hike in the heat remains strong, and I spend some more quality time with the jeep, which takes us to ‘Lawrence’s House’, its rectangular sandstone bricks representing the rumoured abode of T.E. Lawrence during his traverse of Wadi Rum in 1917-18. 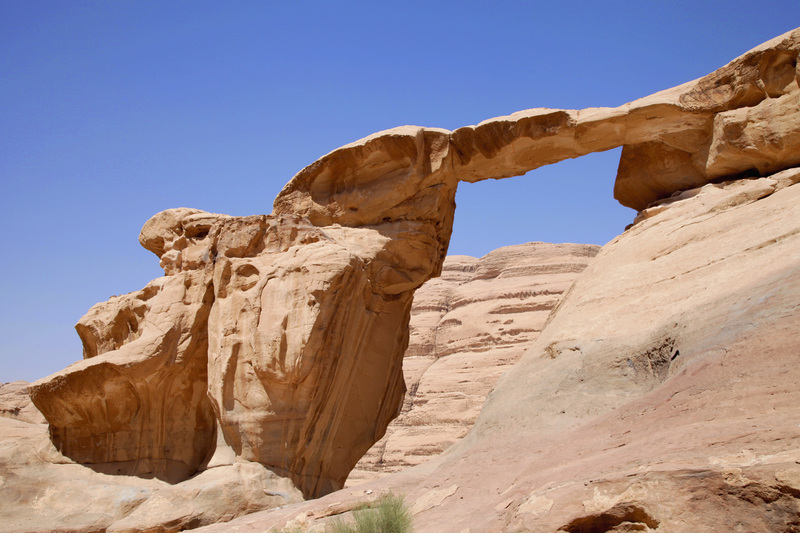 Next, I ascend Jebel Umm Fruth, a small rock bridge, but it is little consolation for missing the achievement of scaling the larger, more spectacular Burdah Arch. After lunch in the shadow of another mountain and a long nap, we take a dip in the chilled waters of a local spring, before heading back to camp for another night under the stars. Back in the jeep after dinner, we career around in the pitch black attempting to spot a fox, but they outsmart us: a glimpse of two bright eyes in the headlights, and they’re gone. A lone hedgehog is not so lucky — Attayak brings him back to camp, where he cowers on a ledge until set free. By morning, I am intent on making my way up at least one jebel during my stay, and after some firm negotiating, Ahmed and I settle on Jebel Khasch. Armed with plenty of water, it is a straightforward climb, beginning in a valley scattered with rocks, as if a landslide has just occurred. As we climb, rocks turn into boulders into steep walls, and the forms and colours become more spectacular: smooth, weathered surfaces are supported by finely-layered shelves of off-white, bright beige and plum. At the summit, I look out at the desertscape, its varying shades and endless mountains muted by the haze, but epic nonetheless. Most tours would traverse the plateau, descending on the other side to allow for a range of perspectives on the surroundings. However, I am now short on time, and we head down to our starting point. We meet Attayak for one last lunch in the shadows, where I am also introduced to a new friend — the camel who will take me back to the village. She kneels obligingly, while I ascend tentatively. Soon the rhythm is familiar, and I am able to relax my grip. Though we go off on a few tangents — my steering is not quite there yet — we slowly move closer and closer to the village, and eventually sand gives way to concrete.